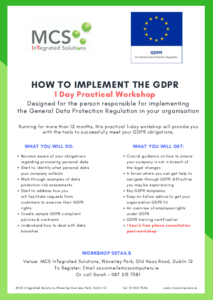 Since October 2017, we have run a series of GDPR practical workshops here at MCS, allowing attendees the opportunity to gain hands-on experience of the work they need to do for their own organisation. Staff who will be running the GDPR compliance programme within their organisation. No previous knowledge or experience of GDPR required. €295 + VAT for each attendee. The course content can be seen in the image below – simply click on it to expand.